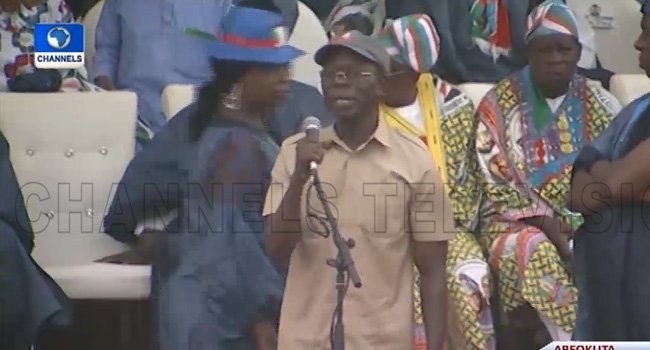 The National Chairman of the All Progressives Congress, Comrade Adams Oshiomhole was booed at the presidential rally of the party in Abeokuta, Ogun state on Monday. According to a footage by Channels television, trouble started when Oshiomhole mentioned the name of the party’s governorship candidate, Dapo Abiodun. The crowd got angered and started booing the party boss with some throwing stones and other objects at him. It took the intervention of the security personnel who surrounded him to prevent injury on him. Governor of the state, Ibikunle Amosun who is supporting Adekunle Akinlade of the APM also had to intervene and plead with the aggrieved members to respect the presence of President Muhammadu Buhari.